NEW ORLEANS — The Mystic Krewe of Nyx can boast about another first in its impressive young history — a legacy goddess. 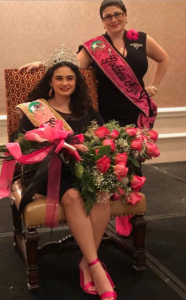 Miss Shelby Ann Seuzeneau, daughter of Kevin and Lori Seuzeneau, will reign as Goddess Nyx VIII during the 2018-19 season. Lori Seuzeneau reigned as Goddess Nyx V during the 2015-16 season. As a teenager, Shelby would watch her mother, who is Co-Captain of Nyx, work countless hours at her day job, then continue to work in the evenings to help make Nyx the success it is today. Wearing the same crown to the ball that her mother wore during her 2015 reign, Shelby will experience the sights and sounds of Mardi Gras in a brand new way — from the top of her float instead of behind a barricade. The Mystic Krewe of Nyx will roll on the traditional Uptown route on February 27, 2019. For more information visit KreweOfNyx.org. Previous PostPrevious Look for the new Krewe of Nyx license plate! Next PostNext Finding My Sisterhood —-	Over Mardi Gras 2018, falling in love with the style and sisterhood of the Mystic Krewe of Nyx, I had joined the list of Ladies in Waiting on a whim, thinking nothing would probably come of it. Months later I had unexpectedly received an invitation to join the krewe, and while I was very excited to join, I had reservations to jump in since I didn’t really know anyone else involved. As I’m on the northshore, I was also a little reluctant, fearing I would be left out of the loop as I don’t live in the city. Thankfully, I took the leap and accepted the invitation to take part in the 2019 season. Over the summer the krewe held a welcoming brunch for members, both new and returning. I thought this would be a good time to get dressed up and meet some of my new sisters. I walked in to the event, still a bit nervous as there was a sea of faces I did not recognize. I found a table of ladies that looked friendly enough and asked to join them. As luck would have it, the whole group was new as well and did not know anyone else either. We all hit it off immediately and decided to stay in touch throughout the season. We started a group chat and would message each other with questions, purse ideas, sharing krewe information, or just reveling in our collective excitement. Beyond that, we all really got to know each other on a more personal level as well, opening up our homes and carpooling with each other when we could. Since our krewe is so large, there are many ladies who, like me, don’t live within city limits. However, I never once felt like I was missing out since I had these women to talk about all things Nyx. We are all very busy, some of us with small children, some of us with night jobs, (one was even planning her wedding during the season!) but we always had a moment to cheer each other on and offer advice, tips, and tricks we learned along the way. About half of our group didn’t live in New Orleans so we didn’t get to see each other all the time. Nevertheless, we were able to share a table again at the Nyx Myx and dance the night away together in our finest. The dancing didn’t stop there, though! At the parade pre-party, we donned our costumes and headdresses and got ourselves amped up for the big ride together on the dance floor. All but two of us wound up on separate floats but through our group chat, it still felt like a shared experience even on parade night as we rolled through Uptown. I’m so thankful I decided to join Nyx and meet these wonderful ladies. We are very excited for the upcoming year and have already been discussing plans for purses and events. I hope that anyone who is on the fence about joining will consider everything that you have to gain in saying YES and joining the biggest and best sisterhood in New Orleans! This is the new Krewe of Nyx Blog where you will find the latest news about all things Nyx. Feel free to comment and share all the goodies herein. Finding My Sisterhood —-	Over Mardi Gras 2018, falling in love with the style and sisterhood of the Mystic Krewe of Nyx, I had joined the list of Ladies in Waiting on a whim, thinking nothing would probably come of it. Months later I had unexpectedly received an invitation to join the krewe, and while I was very excited to join, I had reservations to jump in since I didn’t really know anyone else involved. As I’m on the northshore, I was also a little reluctant, fearing I would be left out of the loop as I don’t live in the city. Thankfully, I took the leap and accepted the invitation to take part in the 2019 season. Over the summer the krewe held a welcoming brunch for members, both new and returning. I thought this would be a good time to get dressed up and meet some of my new sisters. I walked in to the event, still a bit nervous as there was a sea of faces I did not recognize. I found a table of ladies that looked friendly enough and asked to join them. As luck would have it, the whole group was new as well and did not know anyone else either. We all hit it off immediately and decided to stay in touch throughout the season. We started a group chat and would message each other with questions, purse ideas, sharing krewe information, or just reveling in our collective excitement. Beyond that, we all really got to know each other on a more personal level as well, opening up our homes and carpooling with each other when we could. Since our krewe is so large, there are many ladies who, like me, don’t live within city limits. However, I never once felt like I was missing out since I had these women to talk about all things Nyx. We are all very busy, some of us with small children, some of us with night jobs, (one was even planning her wedding during the season!) but we always had a moment to cheer each other on and offer advice, tips, and tricks we learned along the way. About half of our group didn’t live in New Orleans so we didn’t get to see each other all the time. Nevertheless, we were able to share a table again at the Nyx Myx and dance the night away together in our finest. The dancing didn’t stop there, though! At the parade pre-party, we donned our costumes and headdresses and got ourselves amped up for the big ride together on the dance floor. All but two of us wound up on separate floats but through our group chat, it still felt like a shared experience even on parade night as we rolled through Uptown. I’m so thankful I decided to join Nyx and meet these wonderful ladies. We are very excited for the upcoming year and have already been discussing plans for purses and events. I hope that anyone who is on the fence about joining will consider everything that you have to gain in saying YES and joining the biggest and best sisterhood in New Orleans! Look for the new Krewe of Nyx license plate! 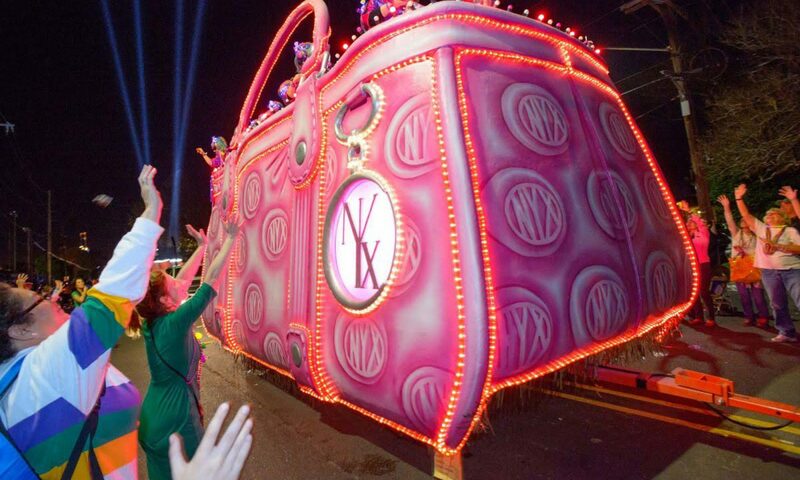 The Krewe of Nyx in New Orleans has earned the honor of being the biggest Mardi Gras parade in history. With over 3348 riders in its 2018 parade, the all-female krewe has broken barriers for the Super Krewes and has raised the bar for parades everywhere. Enter your email address below to start receiving new blog post notifications delivered to your inbox.